Tribe is the hidden history of the Mountains of the Moon, classical antiquity's name for the Ruwenzori Mountains, a glacier-crowned range in the heart of equatorial Africa. The overriding theme of this unusual work is the sacred relationship of race and place. Here the place and the race encircle a massif whose steepness and astonishing, all-but-impenetrable, vegetation create a fastness that soars to clustered peaks of over 16,000 feet. For almost fifty years Tom Stacey has been repeatedly caught up in the turbulent history of the mountains and their people, among whom he is now a mzee - an adopted elder. The stories of tribe and traveller form a single sustained drama, interwoven and inseparable. The reader is carried from the immemorial Africa of Ruwenzori half a century ago, when at twenty-four Stacey was the first white man to live with the Bakonzo tribe, to the armed creation of their own state - a rebel Kingdom; a Kingdom which stemmed in part from the author's first journey. It was to rule the inner mountains for 20 years, defying Uganda and Congo alike. Then came a stormy campaign for the Kingdom's formal recognition and a simultaneous guerrilla war, whose end was marked by the author's recent ascent to the snowbound heights with his Bakonzo companions. From Tribe's sustaining theme Tom Stacey draws a universal proposition - which will be seen as controversial, certainly by those who deny the influence of ethnicity upon the spirit of man. 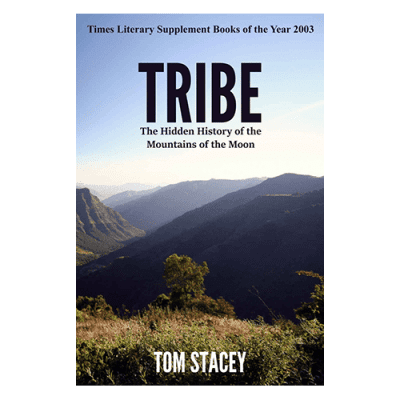 The setting of Tribe may be central Africa, vividly recaptured, but in revealing the hidden history of the Mountains of the Moon Stacey lays open a hidden truth of the human condition everywhere and always. It was THE TIMES LITERARY SUPPLEMENT BOOKS OF THE YEAR 2003.